Mr. Yothin Dumnernchanvanit, President of Double A (1991) PCL. (3rd from left), recently participated as a speaker in a seminar on ‘Business Opportunities in France’. 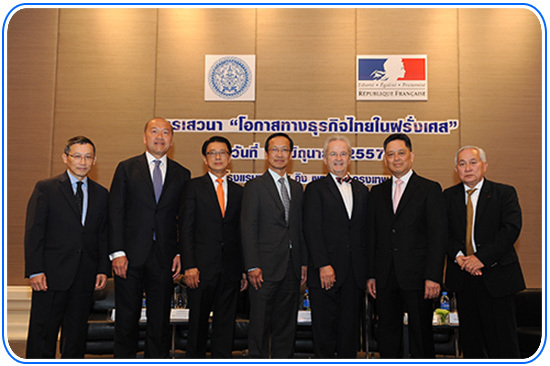 This seminar aimed to present business potential and investment opportunities in France to Thai private sector and businessmen in order to enhance an investment and extend trade into foreign markets. From left, Mr. Narong Sasitorn, Deputy Permanent Secretary, Ministry of Foreign Affairs Mr.Teerapong Junsiri President of Thai Union Frozen Product PCL. Mr. Apichart Chinwanno, Thai Ambassador to Paris Mr. Thierry Viteau, French Ambassador to Thailand Mr.Prakaisak Sawasdisingha and Mr.Chingchai Hanjenluk also joined the seminar at the Pullman King Power Hotel.